2001 – It’s called the “Deorbit” – Space Station Mir was a controlled re-entry into the Earth’s atmosphere. Ultimately, the space station burned up over the ocean by New Zeland. Some parts of Mir could survive the re-entry process, so putting the ship over a large body of water was the best way to reduce casulties. Still, New Zeland was at full alert if winds brought large pieces inland. 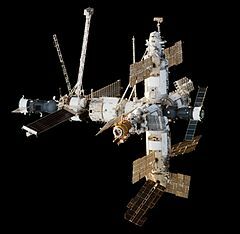 The official statement had Mir at complete Deorbit around 5:59:24 GMT.